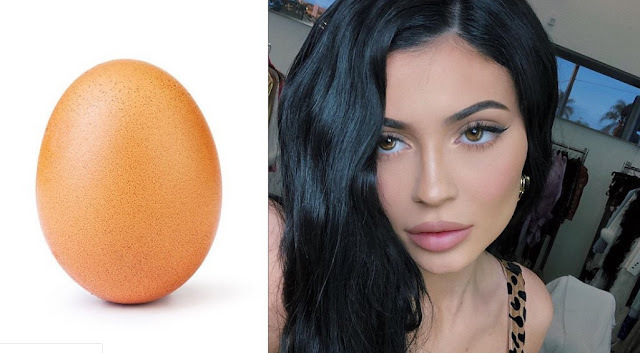 Apparently an egg, a simple egg has broke Instagram Record of being the most liked post of Instagram dethroning Kylie Jenner's post of being the most liked post and Kylie's reaction for the news is simply hilarious. Lipkit mogul Kylie Jenner, 21 is dethroned from having the most liked picture in Instagram by an simple egg post surprising everyone including Kylie who have now even posted her reaction in her Instagram which is hilarious to watch. The post is created by Instagram page EGG GANG (world_record_egg) who posted the picture of an simple egg on January 4, 2014 with caption, "Let’s set a world record together and get the most liked post on Instagram. Beating the current world record held by Kylie Jenner (18 million)! We got this 🙌" And just in 10 days of the post, the picture has most like in Instagram with more than 24 million likes until this time and going more. Previous Kylie Jenner's post of glimspe her child Stromi Webster catching her thumbs was the most liked picture in Instagram. Upon knowing that Kylie has been dethroned from the title, Kylie posted a short video of her reaction in her Instagram page with caption "Take that little egg", with title in the video, "Kylie when see's the world record egg account" where she has an egg in her hand, she sits down feels the hot ground and simple cracks the egg in the ground...pretty funny.